Systems are a quick list of pre-set station parameters available on a per network basis. They can be applied to any unit in the network. Systems that have been set up to represent an VHF mobile station can easily applied to a unit that was intended to represent a UHF repeater. 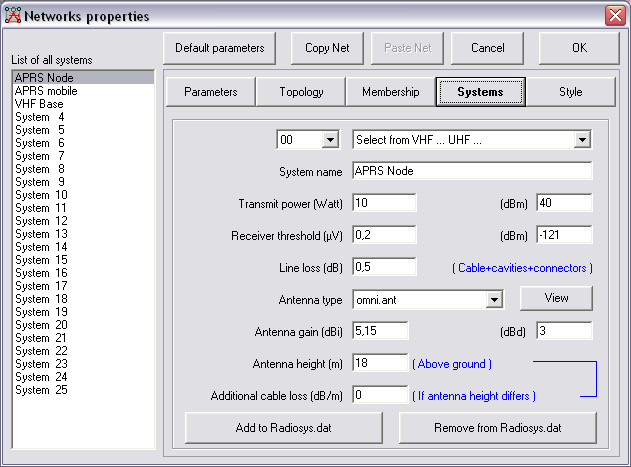 Systems can also be stored in the file 'radiosys.dat' and and are managed through the 'Systems' tab in the 'Network properties'. The radiosys.dat file operates as a 'clip board'. This pull down selection enables to select 100 different radiosys.dat files. Selection is made by choosing the required (00-99) radiosys.dat file. The file is created and handled based upon the number. The file name 'radiosys.dat' is extended to 'radiosys01.dat'. Use this list to get predefined system parameters from the file radiosys.dat. This file can be edited with Notepad. More information about the radiosys.dat file at 'radiosys.dat'. Through the 'Add to radiosys.dat' button a pre-set system can be stored in the radiosys.dat file for later recall. A saved setting cannot be changed by applying the 'Add to radiosys.dat' button again. Before storing the new settings the settings have to be removed by the 'Remove from radiosys.dat' button. If the value in Watts is entered the equivalent value in dBm is calculated. If the dBm values is entered the equivalent value in watts is calculated. Receiver threshold in micro Volt in to 50 Ohms. When the receiver threshold value is entered in uV the equivalent value in dBm is calculated. When the dBm values is entered the equivalent value in uV is calculated. This is the loss in internal cabling, cavities, filters, etc. To translate from dipole to isotropic just add 2.15 dB.